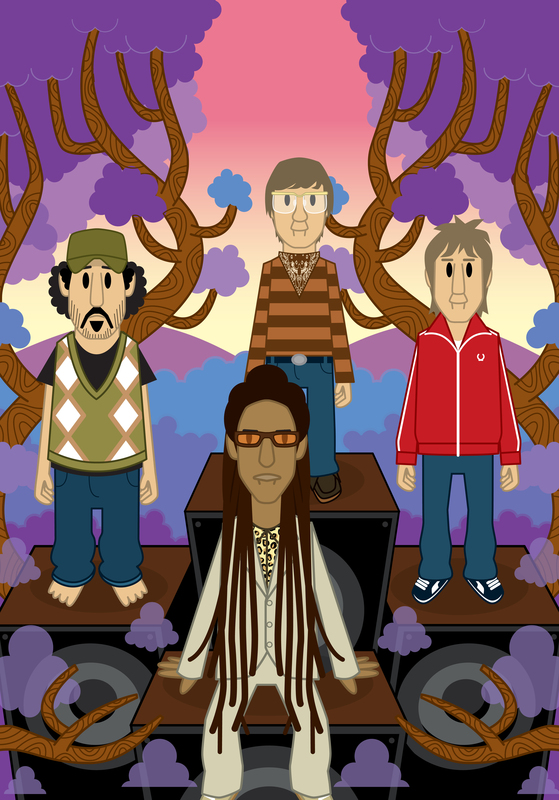 The artist is Pete Fowler, who I met back in 2007 when we appeared alongside Don Letts and Andy Votel as a collective of DJs, the Invisible Players, at a series of festivals – Lovebox, Rockness, Big Chill and Bestival. We played in an outdoor Rizla sponsored space, which looked amazing when the crowd were packed in – its amphitheatre vibe making it a proper arena of dance, with the DJs housed in a 1920s van and a Funktion-One Sound System cranking it out. The Invisible Players really helped me establish myself on the festival circuit – the Rizla arena a massive success. The following year I was back, this time with Annie Nightingale, Justin Robertson and Kid Acne (I was the only Invisible Player to do more than the one season). I hadn’t seen Pete since, but recently bumped into him at Festival No.6 in North Wales, where he told me he had an exhibition coming up at London’s Book Club on the theme of ‘Smooth Overlords’. 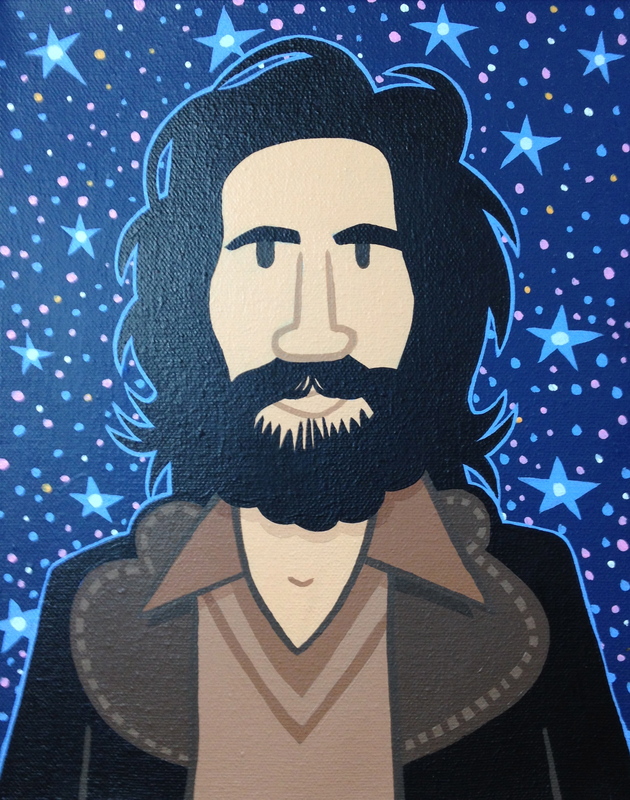 He showed me a photo of the Mancuso painting on his phone, and I mentioned that I’d like to do something about it on the blog. I emailed him, but never heard anything back. Then, last week, he contacted me via Twitter – seems I’d been trying to reach him via an old email, so I’d missed the opportunity to flag up his Book Club exhibition. I hadn’t realised the painting was for sale until then, so, with a print of the Invisible Players (below), which Pete had done for the cover of Blowback magazine, already adorning one of the walls of my home, the chance to own an original piece of his, especially something so relevant to DJ culture, was too good to miss. R.I.P Invisible Players! Best festival summers ever. 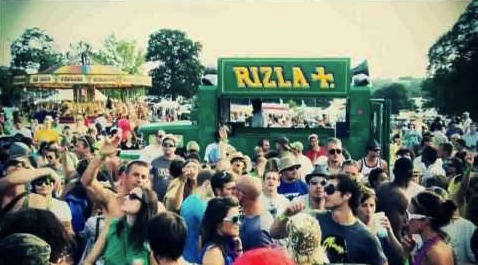 Fond memories of the Rizla amphitheatre Greg! 🙂 Remember being drawn in on a gorgeous sunny August afternoon, it was going off nicely! Quickly rounded up a few mates to join the festivities, some good times had there fella.